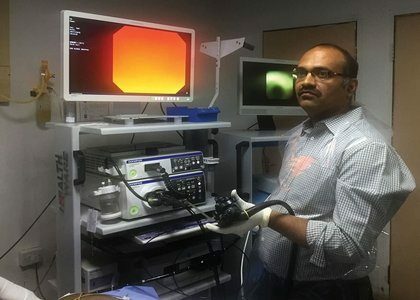 Bengaluru : BGS Global Hospital, a super specialty quaternary care centre, presented the successful use of Spy Glass procedure to diagnose and treat large CBD stones without surgery. The use of Spy Glass procedure is a recent development in the field of medicine and has been adopted by only a few specialty hospitals in the country. BGS Global Hospital, Bangalore is the first hospital to use this procedure in the State of Karnataka. The Gastroenterology team at BGS Global Hospital led by Dr. BS Ravindra, Chief Medical Gastroenterologist conducted the procedure along with Dr. Adarsh C K, Consultant Medical Gastroenterologist and Dr. Narendra. Spy Glass is an innovative system that provides unprecedented, direct visualization of bile duct (liver tube). This procedure enables the doctor to potentially secure a definitive diagnosis and perform therapeutic intervention in one procedure. It is a miniature endoscope of 3 to 3.33 mm, with an attached camera, that can be used to enter the liver tube and break down large stones in the bile duct. It is designed so as to optimize procedural efficiency and productivity with improved ease of setup, ease of use and image quality. It also helps in detecting liver tube tumors and in taking biopsies. Traditionally, ERCP procedure was used to diagnose and treat conditions of the biliary and pancreatic ducts. It was often seen that situations wherein ERCP and additional tests like CT scan, MRI and/or endoscopic ultrasonography (EUS) failed to diagnose the exact pathology, because of which treatment was often unsuccessful. “Patients often needed multiple sessions of ERCP for removal of these large stones, and one could not guarantee safe removal. Using Spy Glass, fragmentation of these large stones is easy and efficient. The procedure can almost always be completed in a single session, and multiple sessions are rarely necessary. Stone fragmentation and removal is successful” commented Dr. BS Ravindra. At BGS Global Hospital, this procedure is used on 3-4 patients on an average in a month. A case in point is that of Mr. Rajesh (name changed), aged 26, who underwent a gallstone removal surgery at a local hospital in Gulbarga. He developed jaundice post-surgery due to a stone that had slipped into the bile duct. The endoscopic procedure was repeated twice, rather unsuccessfully. Finally, he was sent to BGS Global Hospital, where the Spy Glass procedure was attempted on him. The doctors were able to break the stones using laser and thereby remove the stone. Another case was seen wherein, the patient, Mr. Sharath (name changed), aged 50, was diagnosed with Liver Cirrhosis and was awaiting a liver transplant. Unfortunately, he developed jaundice suddenly. The team of doctors identified a block in the liver tube through a CT scan and MRI. They decided to use Spy Glass procedure to identify the cause of block. The block was then removed using a stent. The patient has been relieved of Jaundice as well. The Spy Glass procedure normally takes 45 minutes to an hour. The recovery period is quick and pain-free, as it takes about 1 hour for the anesthesia to wear off and the patient may leave the hospital in 4 to 6 hours. In very few cases, the patient is kept overnight for observation. With traditional methods of treatment, the patient would have to undergo either open surgery or keyhole laparoscopy, both requiring the patient to be admitted in the hospital for 3 to 4 days. Thus, cost is considerably lesser; as much as 30-40% reduction in cost is seen. Hence, moving forward more surgeons and gastroenterologists will start recommending this, as it becomes easily available in hospitals. Could you please provide contact details where spyglass treatment provide in India ?